Requiem Mass Wednesday, February 15, 2017, 10:00 A.M.
Catalina (Ninna) Macaltao Schmit, 49, of Quezon City, Philippines and McKinney, Texas died Sunday, February 5th, 2017 at the Texas Presbyterian Hospital in Plano, Texas. She was born on April 12, 1967 in Quezon City, Philippines to Sabino and Lilian Macaltao. She is survived by her husband, John C. Schmit of McKinney, Texas. They were married in San Antonio, Texas on February 14, 2010. Also surviving are her mother, Lilian Macaltao, a sister, Carolyn Macaltao, brothers, Gerard and Gregory Macaltao, her father-in-law Loran C. Schmit, her mother-in-law Irene J. Schmit, Brothers and sisters in law: Marcia Schmit, Steve Schmit (Diane), Mary Schmit, Julie Schmit Albin (John), Michele Schmit, Susan Schmit (Kathryn), Jean Schmit Hopwood (Kevin), Lorin Schmit Dunlop (John) & Michael Schmit. Also surviving, many aunts, uncles, nieces and nephews. She is preceded in death by her father Sabino Macaltao, Grandmother Lola Matilde Gaerlan, and Great Aunts Lola Agnes Cabaῆero and Lola Caridad Cabaῆero. Catalina (Ninna) went to school at Maryknoll Convent School and Saint Louis University Girls’ High School of Campo Filipino in Baguio City, Philippines. 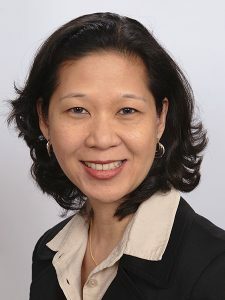 After graduating high school in 1983, she moved to West Triangle, Quezon City, Philippines where she spent a significant time of her adult life. In 1987, she obtained her bachelor’s degrees in accounting and economics from the De La Salle University in Manila, Philippines. She worked as an accountant at Sycip Gorres Velayo, as a brand manager at Metro Labs Philippines and co-founded and headed Avatar Inc., a successful clothes manufacturing company. In 2003, she immigrated to New Zealand where she was an Executive Assistant to several CEOs. She permanently settled in Texas in 2010 upon her marriage to John Schmit and worked in the global relocation industry. Her last job was at Altair Global as a Global Compensation Analyst. Catalina had a vibrant personality and is lovingly remembered by her family and friends for her kindness, generosity and counsel. She loved to travel and traveled extensively around the world - a passion she shared with her husband, John. She loved musicals, plays, classic movies, bonding with family and friends, and devoted her free time to church and community activities. Catalina had many memorable events in her life but she always remembered the time she personally welcomed and hugged St. Pope John Paul II during his visit to Manila in January 1995 for World Youth Day. Her mother Lilian’s favorite memory is of watching Ninna on TV, run across the stage and being embraced by Pope John Paul II. Visitation will be held at Charles W. Smith & Sons Funeral Home, 601 S. Tennessee Street, McKinney, Texas on Friday, February 10th, from 6:00 P.M. to 7:00 P.M. Immediately following the visitation, a Rosary will be said for Catalina. The Funeral Mass will take place the following day, February 11th, 1:00 P.M. at St. Gabriel the Archangel Catholic Church, 110 St. Gabriel Way, McKinney, Texas. Father Don Zeiler will be officiating. Catalina’s life will be celebrated a second time at services in Bellwood, Nebraska.On Tuesday, February 14th, visitation will be 5-7 with 7 pm Rosary at St Peter’s Catholic Church Requiem Mass and commitment will follow on Wednesday, February 15 at 10 AM at Bellwood. Father Ben Holdren will officiate.